Who to turn to but the French? 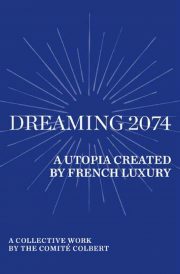 The shared world anthology Dreaming 2074: A Utopia Created by French Luxury puts its central conceit right there in the subtitle. Commissioned by the Comité Colbert—“78 firms from the French luxury sector and 14 cultural institutions, which have joined together through common values”—the anthology (comprising short stories and other works) uses a shared universe to paint a picture of a 2074 that has weathered calamity to become a world materially and culturally superior to our own.